I do not like the works of Picasso. I recognize that his paintings changed the course of art forever, and they are done with incredible skill and talent. I just don’t like them. They’re not my jam. 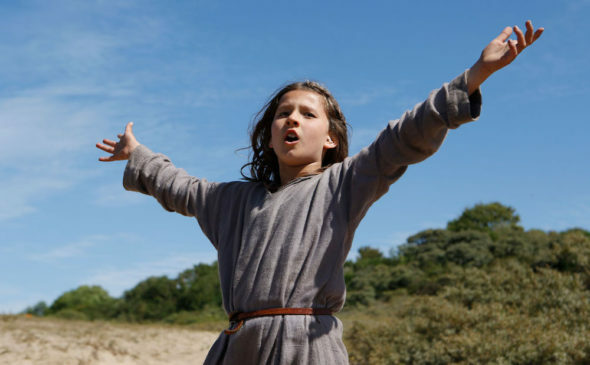 I also did not like Jeannette: The Childhood of Joan of Arc. But art isn’t always about whether you like it or not. And, unfortunately, art is almost never about me. Jeannette is beautiful, absurd, and a true test of endurance. I’ve read that Bruno Dumont does not cast experienced actors. That much is painfully obvious from a litany of bizarre deliveries, missed high notes, and the ultimate theatre sin: I-don’t-know-what-to-do-with-my-hands thigh slaps. In harsh contrast to the period, pastoral landscape and costuming is the original soundtrack from avant-garde band Igorrr, full of electric guitar riffs that all sounded the same even twenty minutes in. The accompanying choreography, always including stomping and head banging, is as bizarre as it is uncomfortable. After the third pitchy prayer to god by doe-eyed Lise Leplat Prudhomme, I stopped asking Jeanette to be a musical. I waited for Jeanette to simply be… whatever it wanted to be. Hark! Deliverance! Director Dumont hits his bizarre and delightful stride when identical twins Elise and Aline Charles play Madame Gervaise simultaneously. They speak quickly and flatly, alternating between speaking in turn and in unison. “I” they chorus. They chastise Prudhomme’s Jeannette for questioning God. They are the Tweedledee and Tweedledum of eternal suffering. Later, the Charles sisters appear as floating visions of saints. I realize that Jeanette is unfolding like a Medieval epic poem. Characters call to God, visions appear from nowhere, and the choreography mimics the exaggerated gestures of much older theatrical performances. The longer scenes drag on the more they make insane sense. Not much happens in Jeannette. A solid 80% of the film is shot from the same angle in the same field. The characters talk in circles about eternal suffering and God’s plan for France. It gets tedious. Boring. There’s a glimpse into the true absurdity of Dumont’s vision when we finally see into an older Jeanne’s home (played now by a righteous Jeanne Voisin, much better than her young counterpart). Jeanne’s brothers, with no lines, undulate as her father sings their work order for the day. Her uncle (a green but intriguing Nicolas Leclaire, who raps instead of singing) writhes in the corner, throwing in a few dabs for good measure. The height of lunacy is where Dumont is most brilliant. If anything, his greatest hindrance was not going big enough. Dream on, my dear Dumont. Surely you’re doing something important for the rest of the film world. It’s just not my jam. And that’s okay.